Our world-class buildings such as the award-winning EEE building, interdisciplinary Mountbatten complex and the Life Sciences building have contributed to the University of Southampton’s status as one of the best learning environments in the UK. These facilities are a result of an investment of £200 million. The University provides a wealth of social, arts and leisure facilities for students. Off campus, you will find all the transport, shopping and leisure facilities you would expect from a multicultural city with a population of over 200,000 people. Wireless and networked high-speed internet access is widely available across all campuses and in all five libraries. Economics is situated on the University's Highfield campus, which includes the Hartley Library, public access computer laboratories, a wide range of teaching and social accommodation, banks, shops and restaurants. We are part of Economic, Social and Political Sciences, and therefore postgraduate and postdoctoral researchers can take advantage of the support, research and personal development training offered by the Faculty Graduate School. The Bloomberg Professional software provides students with access to real-time data, breaking news, and powerful analytics. 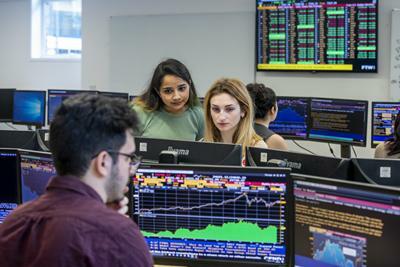 Once a Bloomberg account has been created, students can have immediate access to an online archive of information that have been accumulated by more than 327,000 of the world’s most influential decision makers. At the University of Southampton we provide our students with a number of IT services to help make studying as smooth as possible. These range from free Wi-Fi to specialised software, help to fix your device, support of computer workstation rooms and high performance computing. For more information on the services we provide, including how to contact us to request assistance, please see the iSolutions website.